This is a 7 x 5 windowless shed and it is very useful primarily due to the fact that it has no window. This makes it a true security shed. 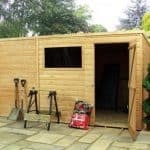 You won’t have to worry about thieves because this shed acts a deterrent. With no window, there is nothing to see. This means no theft. But the building is also sustainable code compliant. This means that property developers, who have to adhere to the code, have a building that helps them with their projects. On the outside the shed has a very modern if not simplistic design. We like its natural look and feel it gives a great rustic feel. Internally the shed also offers a good amount of space. The apex roof allows additional height, allowing you to store taller objects if needed. 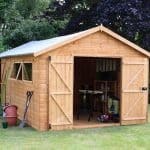 The construction appears strong and durable and all in all it looks to be a great entry-level shed. Windowless design – Whilst windows can provide great natural lighting, preventing the need for an electrical pack, they also pose a security concern. This shed benefits from a windowless design, ensuring additional security. 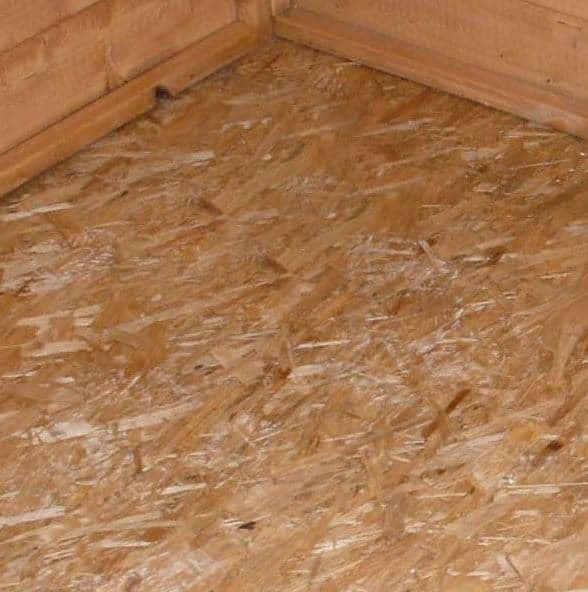 Solid sheet floor and roof – Solid sheet materials are included for the floor and roof. These help to boost the strength of the sheds structure. The roof board measures 8mm thick, while the floor’s material measures 10mm thick. Overlap cladding – The overlap cladding design is another feature which adds strength to the shed. 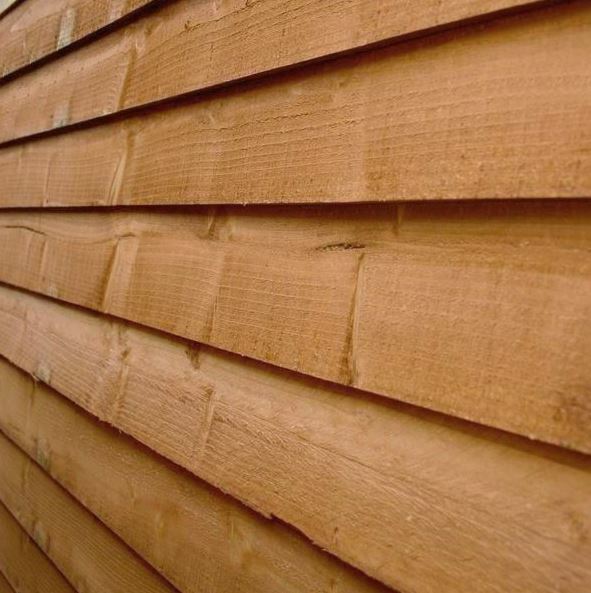 It is one of the easiest types of cladding to construct which is reflected in the lower price. Just like fence panels, the timber boards overlap each other and when treated they provide excellent weather protection. Sustainable Homes Compliant – This feature mainly benefits property investors, though it is also reassuring for those who care about the environment. Being sustainable Homes compliant means the shed benefits from a more eco-friendly design. FSC Certified– The materials used for construction are taken from sustainable forests where trees are replanted to replace the ones that have been chopped down. Lock variations – One of the more unique features of this shed is the ability to choose the type of lock you would prefer. You have a choice of hasp and staple, BSI rim lock or a standard rim lock. Choice of roof felt – The shed comes with heavy duty roof felt, though you can choose to add extra levels of protection. 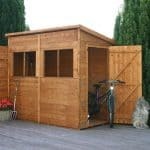 Your belongings are kept safe and secure in this shed thanks to its numerous safety features. It comes with three different lock options, though you do need to pay to upgrade to either a hasp and staple or a BSI Rim lock. As it doesn’t have any windows, nobody will know what you are storing, making a good deterrent for potential thieves. The overall construction is also really solid which means it can safely store heavy items with ease. We found this shed to be one of the easiest to construct. While it is a two person job, the instructions and the quality of the panels make it easy to build. The only reason it didn’t score higher on our assembly rating is because it still requires hard labour and can take a good few hours to put together. 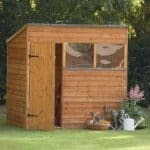 The biggest attraction of this shed is the fact it comes at such a low, affordable cost. 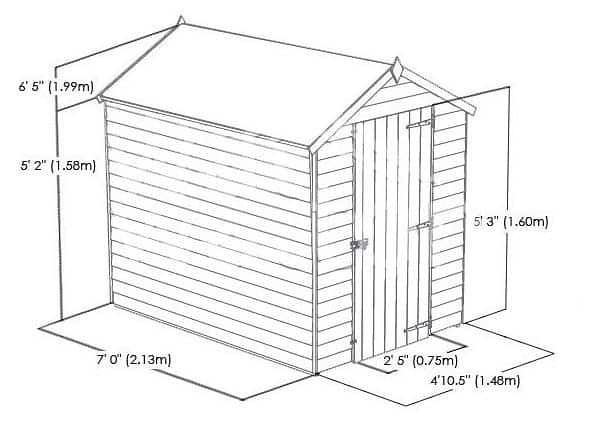 Considering its size, the shed is priced lower than some of the smaller sized sheds. This is largely due to the overlap cladding. Out of the three different types of cladding construction, overlap is the cheapest as well as the easiest for manufacturers to use. It provides a reliable and durable finish that can stand up to the unpredictable weather that the UK is famously known for, once it has been treated. The fact it meets the Sustainable Homes Code requirements is also beneficial. 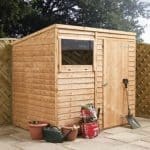 Not only does this make it a great choice for property developers, but it also makes it a good choice for those who are looking for an environmentally friendly shed design. 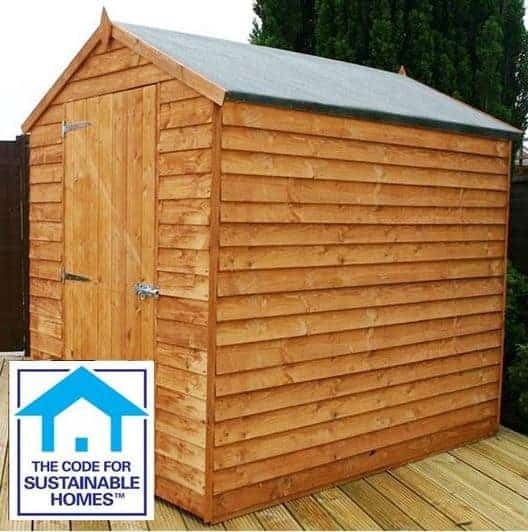 FSC certified, you are also given peace of mind that the shed has been constructed from sustainable woodland. Another important benefit is the windowless design. If your garden isn’t overly secure, if the shed was to have windows then there’s a chance thieves could get in and see what’s inside. So if security is a main factor that you need to consider, this is a good model to choose. Like all sheds, there are a few disadvantages you need to be aware of. Firstly the overlap cladding does provide weatherproof protection is it is treated with a good quality preservative. However, if you construct the shed in a sunny area, there is a chance it will warp over time. It also isn’t as durable as sheds made from tongue and groove or shiplap cladding. However, on the flip side this means it does come at a low cost. The quality is still excellent and with little maintenance it should last you for many years. Finally the unpainted design may be a disadvantage for some. It comes with a rustic finish and the overlap cladding does provide a rather rough exterior. However, this can easily be fixed if you use a coloured treatment, or you can paint over the wood later if you’d prefer. 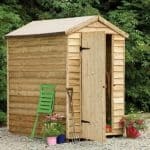 With a good amount of space and an extremely affordable cost, we do recommend this shed if you’re looking for a basic storage solution. Thanks to the windowless design you can store valuables if needed and the lock also makes it more secure. It is a reliable, durable shed that provides exceptional value for money.